In my recent stumblings on the web, I came across one heck of a Fly Fishing Artist. Jon Waske, an avid fly fisherman, artist and fly tyer produces some of the best trout and fly fishing art that I have come across. His favourite waters to fish are in Michigan, Wisconsin, Minnesota and California. Quite a ways from my home waters in Ontario Canada, but his art hits very close to home for me. All art work produced by Jon is original, and all prints and originals are hand signed by him. It is obvious the amount to time he puts into each work, and the resulting art seems effortless. The pieces are truly breathtaking. 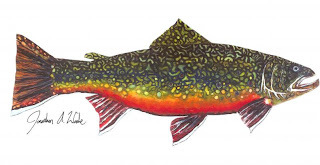 As an avid brook trout fisherman, I was drawn to the Brook trout print Jon has available. As with all of his work, Jon has captured the colours and magnificence of this truly remarkable species fish of fish. The only native ‘trout’ or char that inhabits the streams in my area. With the Brook trout print, there are also countless other species that Jon has painted in great detail including Smallmouth bass, Brown trout, Salmon and many many more. Included in the collection are also several landscape style works. The one that really caught my eye was the “Deep Water” piece. This work shows a fellow standing waist deep in a deep river run, rod buckled over. This piece says solitude to me. Something I seek each and every time I am on the river. Whether there are other folks around or not, I try to find that special place where I go. This piece takes me there.